"For 20 years, photographer Nicholas Syracuse has chronicled people who travel the American backroads and train yards just outside our view, capturing stunning images of hidden places and people. His profound, mysterious images seem to always be in motion, luring him towards the freedom of the travelers, even as his loved ones call him back from the road. 'Traveler' portrays the close relationship between the photographer and his subject. 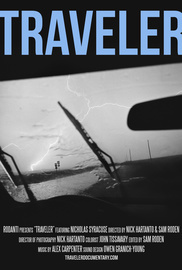 The film documents the life of travelers; drifters, train hoppers, hobos and runaways. Official Selection Ashland Independent Film Festival 2016."